City contractor Custom Tree Care Inc. began the removal of select City-managed ash trees on March 9 and is expected to complete removals by the end of the month. Approximately 165 ash trees located on City right of way will be removed with the stumps ground and grass replanted as part of this project. The contractor began in Zone 1 and is progressing through Springfield in order of City Council zone. The emerald ash borer, discovered in Greene County last summer, is an exotic beetle from Asia whose larvae feed on the inner bark of ash trees, killing the tree within a few years. The beetle is responsible for the loss of tens of millions of ash trees in North America. Preventive insecticide treatment options exist, but cannot eliminate an infestation once it occurs. 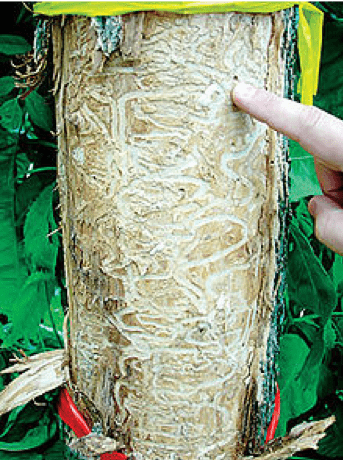 The City budgeted $75,000 in 2019 for emerald ash borer management. These funds will be used for the preventive treatment of about half of the City’s ash trees and the removal of trees that are in poor condition or location. Staff in the urban forestry division of Public Works identified and inspected a total of 380 City-managed ash trees located in public right of way to determine whether to remove or treat each tree. In the next five years, the City plans to replace 165 ash trees and treat the remaining 215. Depending on the method, ash trees must be treated every one to three years to prevent infestation. For every ash tree removed from City property, another species of tree will be planted. Kellner suggests that residents who choose to remove ash trees on their property follow the same protocol. She says it’s unknown how many total ash trees are in Springfield, but wants to reassure residents that the majority of the community’s tree canopy will not be affected by the emerald ash borer. To determine if an ash tree is located in the public right of way, please review this map. The City recommends that residents take inventory of the ash trees on their property and assess whether the trees are healthy enough for preventive treatment or if they need to be removed. A licensed, certified arborist is the most qualified to oversee the treatment and removal of ash trees. Ash trees located on private residential and commercial properties are the responsibility of the property owner. If an ash tree is healthy, property owners can treat it with insecticides. Kellner said the cost of preventative treatment is about $10 for each diameter inch of the tree and needs to be retreated according the insecticide chosen. Kellner said untreated ash trees can be problematic. Once an ash tree is killed by the emerald ash borer, the tree becomes brittle and more difficult and costly to remove. It can also present safety and property hazards. To properly dispose of an infested ash tree, trees or branches measuring 6 inches in diameter or larger can be taken to the Springfield Sanitary Landfill, 3545 W. Farm Road 34. Anything measuring 6 inches in diameter or smaller can be disposed of at the Yardwaste Recycling Center, 3790 S. Farm Road 119. According to Kellner, the current disposal practices at these facilities are sufficient to prevent the spread of the beetle.